As it was a short meeting I’ve already uploaded it to Youtube. It’s in two parts, part 1 (the first twelve minutes) and part 2 (the last eight minutes), which are also below. 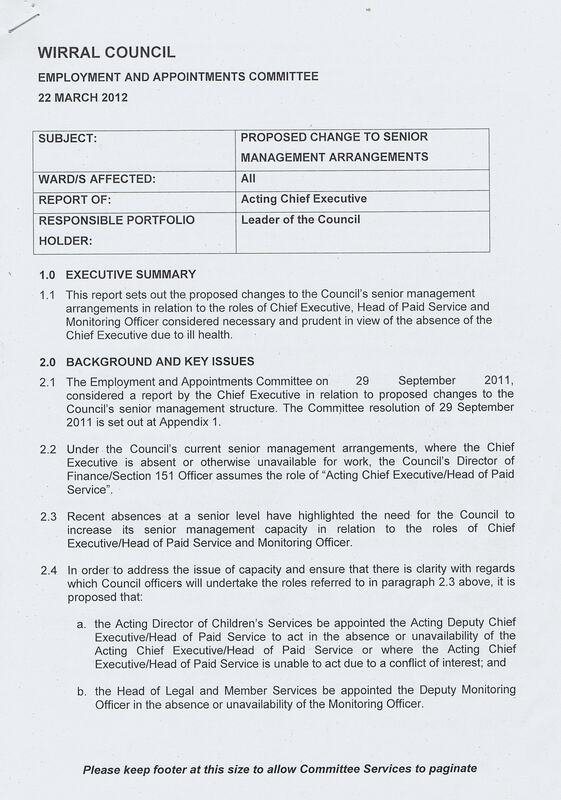 The agenda and reports can be found on Wirral Council’s website except at the time of writing this, the AOB item entitled “Proposed Change to Senior Management Position”. 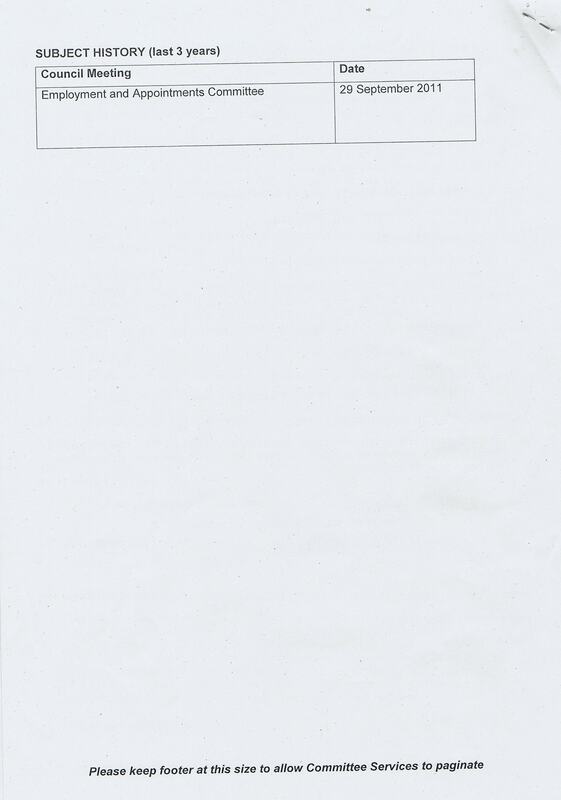 It’s four pages which I’ve scanned in, Page 1, Page 2, Page 3 and Page 4. (c) Shirley Hudspeth, Democratic Services Manager stops being Democratic Services Manager and becomes Scrutiny Officer (Head of Legal and Member Services). 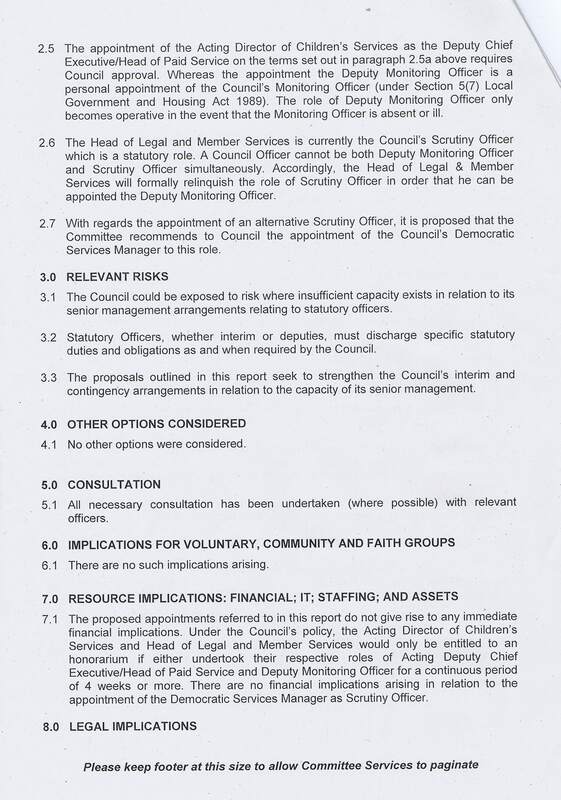 The Committee agreed to recommend (a) and (c) to Council and noted (b). 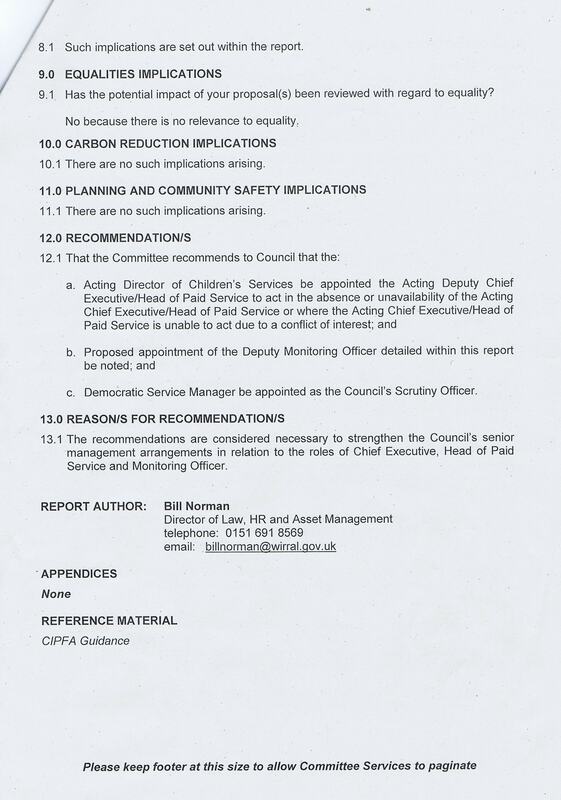 Items 5 (Chief Executives Office) and 7 (Department of Regeneration, Housing and Planning: Senior Management Structure) were deferred to a future meeting. Of course this “gross misconduct” aspect of the disciplinary process appears to have absolutely nothing to do with the lucky few on the top tier does it? Or indeed those high level long term abusers on their way out, who may potentially point the finger at their guilty senior counterparts. No, they get paid off a tidy sum of public money in exchange for their silence – all wrapped up in a compromise agreement with a gagging clause. Or is this disgraceful immoral unscrutinised conduct about to change? We await….. Unfortunately the crossed out bits of this comment didn’t copy and paste when I copied it so I’ve erased it. Q2) In order for that to happen, the appraisal system/performance management systems as well as corporate governance would have to work. In addition the hiring would have to change, otherwise you’d suddenly create a lot of vacant posts. As to making counter accusations, it’s a bit late once they’ve started a disciplinary process they intend to finish because the person “knows too much”. Q3) Only if the people change and accountability comes back, but the media and politicians can only go so far as inevitably the politicians find they were responsible for some decision/s in the past that with hindsight look dodgy… but seemed perfectly reasonable to the councillors at the time that officers suggested that course of action. Do you reckon there will be a public inquiry?